With the scenic and challenging Palos Verdes race coming up this week and the Riverside run happening on Dec. 4, here are a few tips so you are in top form come race morning. Being a strong and balanced runner is a keystone to achieving your personal best and having a great time in the process. Planking– Doing a plank daily increases your core strength and is essential for maintaining good running form, which decreases the risk of injury. Try adding two sets of standard planks (on your forearms) and side planks, holding for 30-60 seconds each, to your workout. This is great practice for the onsite Saucony planking contest that happens after each race! The last planking male and female get a free pair of Saucony shoes! Foam Roll– If you don’t do anything else post run, you should foam roll. The myofascial tissue tightens up as you run and rolling out your IT bands (outer thighs), hamstrings and glutes can prevent injuries as well as help with soreness. It’s like a mini-massage that hurts so good! Hills and Speed Work– Adding in short bursts of sprinting can improve strength and increase speed and hills that call for endurance. You’ll increase muscle power and flexibility as well as overall speed. During your next hour-long run, add in a tempo workout. Run 6-8, 1 minute intervals where you pick up the pace. Push yourself to the pace where you can hear your breathing, but you are not gasping. This puts you right above your anaerobic threshold. Slow it back down to your regular relaxed rhythm for about 6 – 8 minutes before you begin again. If it’s hard to transition back into your relaxed rhythm, you are probably going too fast during the interval work. Box Jumps– Running makes your legs function like springs. Every time your foot hits the ground, certain tendons and muscles stretch like rubber bands to absorb the energy on impact and then release it back into the ground as they return to their normal length. With proper conditioning, your legs can capture and reuse more of this “free energy” and thus run more efficiently. Box jumps are great for increasing stiffness in your legs during impact (a good thing for runners). To do it, stack aerobics steps 6 to 18 inches high (or find a box of similar height). Stand on one leg and jump up onto the step, then immediately back down. Complete 12 jumps, then switch to the other leg to complete the set. Sleep– Your body’s natural rhythms all work in sync and getting adequate rest is tied to your peak performance. Muscles are relaxed during sleep and gives your body a chance to repair broken-down tissue. Hydrate– It’s recommended to drink half your body weight in ounces every day and even more if when you have a race coming up! Stretch it out- Stretching before and after runs will help you maintain flexibility and recover more quickly after long runs or difficult training exercises. Yoga has been incredibly helpful in mixing up the basic runner stretches. 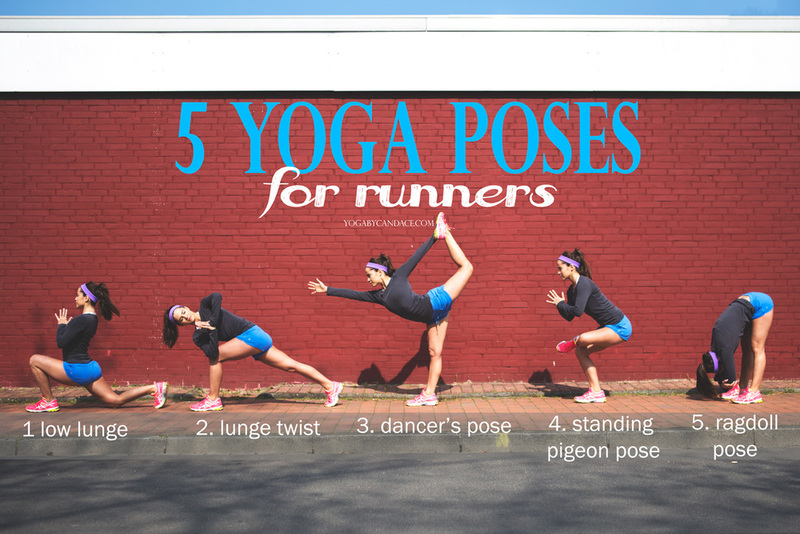 Check out these 5 yoga poses for runners as seen on yogabycandace.com. Set a Goal– Whether it be setting a new PR, or just finishing the race; meeting a goal is a great accomplishment and will change your life! Plus, the Lexus LaceUp Running Series offers a built in celebration with post run brunch and Sierra Nevada beer toast. Celebrating running and friends.